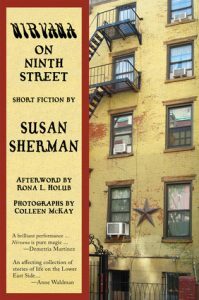 A unique historic neighborhood, a unique historical time (Manhattan’s Lower East Side, 1960s to early 70s): This little poetic gem – fifteen short stories – pulses with the beat of an historically important neighborhood: the Lower East Side to many of us, renamed the East Village in the late sixties/early seventies when it was transforming, to glamorize it. Glamour is not what author Susan Sherman has in mind. Her fictionalized characters are meant to bring life to what was lost due to gentrification. Also a poet and an activist, Sherman lived in this area during this spirited time. Perhaps she even rented an apartment in a tenement building like Rachel, the main character all others revolve around. Rachel’s building, 630 East Ninth Street, looms large, as nearly all the characters are residents in her building. She seems to have known them all. Many were friends, or lovers of her friends; many were artists forced out of Greenwich Village as rents became unaffordable. The collection opens with a black-and-white photograph of three street signs, pinpointing the corner where East 9th Avenue B, and Charlie Parker Place converge. Streets that run along Tompkins Square Park, with its own legacy of displacement in the eighties and nineties. Five more images, all taken by Colleen McKay, are sprinkled throughout. Her background – along with Rona L. Holub’s who wrote an informative, condensed historical Afterword, and the authors’s – can be found at the end. The Lower East Side is famously connected to the immigrants who fled here to escape persecution, violence, and other prejudices – especially Jews from Poland and Russia, as well as Dominicans, Puerto Ricans, and African Americans who were marginalized. Their “desires, frustrations, and rage” immortalized here. Sherman had a front row seat to witness historic changes. She’s invested in this place, at this extraordinary time, so she writes from the heart with authenticity. Demolishing old buildings, stripping storefronts isn’t, in Sherman’s telling, about new money and upgraded real estate gained from gentrification. What she offers is the other side: a heartfelt tribute to all that was erased that had given the Lower East Side such a strong sense of character and belonging. 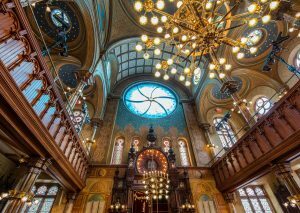 Today nearly all its historic immigrant/Jewish ethnicity is gone, except for a few remnants like the Tenement Museum and Eldridge Street Synagogue. The avant-garde artists, photographers, and musicians in these stories helped define this remarkable era: the Sexual Revolution, Civil Rights and Gay Rights Movements, the Vietnam War protests. The author participated in them all. She weaves these significant cultural and societal changes skillfully, lyrically into the fabric of the stories. While the characters aren’t real, they represent those heady times. They are passionate, unorthodox, artsy, angry, forlorn. Their stories are quite moving. None will leave you wanting; some will sadden you. Together, they add up to a mere 104 pages. A noteworthy literary feat. Even the partially recycled paper the book is printed on, smooth and satiny, adds a special quality to the legacy of those days. Every character connects to Rachel, so the collection reads like a novella. Rachel imparts her memories of neighbors, friends, and lovers fondly and vividly, fully aware their futures were uncertain. As for Rachel, she’s presently 70, living alone with her cat. Once married, she has no children; loved two women, one she believed was her soul-mate. Getting back to that opening photograph that pinpoints the section of the Lower East Side the stories are set in: opposite it are two lines of poetry by the Nobel-Prize winning Chilean poet, Gabriela Mistral. The poem is about the sea. Just a few words yet they convey Ninth Street themes this poet was apparently known for – nostalgia, suffering, the loss of innocence, death. Understanding the meaning of the sea in the poem is key to understanding Rachel, who keeps imagining the sea as she gazes out one of the eight-windows in her apartment. Rachel’s sea seems to be signaling she’s an “optimist at heart,” prepared to accept whatever her future holds. And yet, you won’t find Rachel’s memories mystical; they’re as clear as if it were yesterday. These were her friends, her neighbors, and the lovers they, and she, lost. One of the lonesome voices, she manages to keep herself in check by staying busy with a routine. She’s luckier, then, than some of the other outcast characters unable to control dispirited emotions. Probably the most tragic is Solomon, from the Deep South. An isolated sculptor using scraps of discarded metal to create odd things, expressive of the hatred he endured as a black man in South Carolina. In this welcoming neighborhood, he finds a best friend, CJ, who moved from Harlem when crime was rampant. He’s a woodworker who also creates from discards, but he makes useful things. The two openly share the same girlfriend, a painter. Solomon’s pain and angst is so profound, love and friendship isn’t enough. A Little Night Music is about a singer who sings loudly to drown out her fears, disturbing her neighbors terribly. Caroline is Rachel’s best friend. She was a tailor like her father, who immigrated here from the Ukraine. It was the only way he could make a living since “Jewish scholars at the turn of the century were not valued for their intellectual skills.” Passion and Peace are two look-alike sisters wanting two different kinds of love. Published four years ago, Nirvana on Ninth Street is as timely as ever. Poignant messages about immigrants who were poor but worked hard and so they contributed a richness to the Lower East Side gentrification has wiped out. They lived, toiled, and created under such overcrowded conditions they came to know and care for one another. Something many of today’s communities have lost. The Lower East Side was a unique, we’re-in-this-together, challenged community that gave uprooted people strength and encouragement in spite of their differences. Maybe because of them. Great review, Lorraine! Living in NYC, I’m familiar with the setting and characters who populate this neighborhood. This sounds like a good reminder of the importance of community. It sure is. And, Susan Sherman’s prose is wonderful at weaving all that in. Thanks.